Sunday morning, thousands carrying flags, advocating white supremacy and parading under the banner of hatred will gather in Washington, D.C., to commemorate the anniversary of the Unite the Right march that left one dead and many injured. Last year’s march was held in Charlottesville, Virginia, but this year’s was moved by organizers to D.C. when Charlottesville officials wisely denied permission for a reprise. Kurt Benkert was the starting quarterback for the University of Virginia last year. The team was in the middle of training camp. The events of that day left an indelible mark Benkert will never forget. Atlanta Falcons quarterback Kurt Benkert (6) looks to pass as New York Jets cornerback Xavier Coleman (38) defends during the second half at MetLife Stadium. The events changed his view of athletes and activism and gave him an understanding of how sports could be used to unite communities. 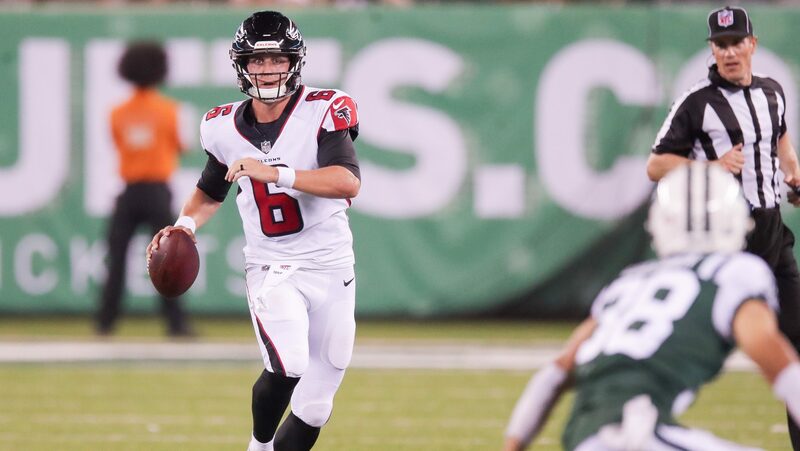 “It was tough because there was a misconstrued notion that that was the idea of the people around the city,” Benkert told me Aug. 10 after the Atlanta Falcons lost to the New York Jets at Met Life Stadium. Today, Benkart is a rookie with the Atlanta Falcons, trying to win a spot as a backup quarterback. The events of last year, the anniversary on Sunday, rekindle memories. The events that unfolded that day brought the team closer together. There was honest, open dialogue in a locker room with a large number of black players. Virginia had a disastrous 2016 season, finishing 2-10. They looked forward to a fresh start and then the Charlottesville hate rally happened. The team got off to a strong start, beginning the season 5-1. Although the Cavaliers slumped at the end of the season, Benkart believed the team helped begin a healing process in Charlottesville. “We felt that we were a kind of rallying point for the community,” he said. Does sports galvanize a community? LeBron James said last week that in his view sports brought people together. I say yes and no. Sports puts people together. I’m not sure the institution always brings us together. The real change occurs not in the stands, but inside the locker room, where black and white players from diverse backgrounds must decide and find ways to work with one another. This often involves understanding, not necessarily agreeing with diverse points of view. White players work side by side with a player who might have had a family member deported, or with a teammate who had family member brutalized by law enforcement. He also believes that sports can be used either to bring people together or as a wedge to drive us apart. 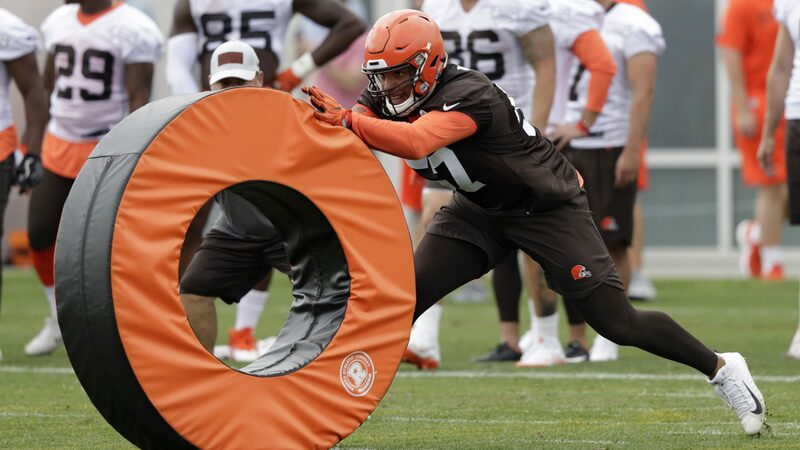 Cleveland Browns defensive end Marcell Frazier runs a drill during training camp in Berea, Ohio. Like Benkart, Marcell Frazier is an NFL rookie trying to earn a roster spot. Frazier is a free-agent defensive lineman with the Cleveland Browns. In 2015, Frazier was a sophomore at the University of Missouri when members of the football team agreed to join students protesting the racial climate on campus and the treatment of black students. The team threatened to boycott an upcoming game if the situation was not addressed. One result of the protest was that the president and chancellor resigned. “That was my first year at Missouri, and I was a young guy on the team, just like I’m a young guy now,” he said when I spoke to him Aug. 9 at Met Life Stadium after the Browns beat the New York Jets. A native of Portland, Oregon, Frazier said, he was raised in a diverse community and largely was shielded from racism. He attended a community college out of high school before going to Missouri. Observing the treatment of black students at Missouri who were not athletes was sobering. “It just opened up my eyes,” he said. “Being from Oregon, I was naïve to some stuff. I just kind of lived in my bubble. Portland is different place, and I never really was exposed to a lot of stuff. In his first season at Missouri, Frazier learned firsthand about the collision of sports and racism. He learned that as a black athlete in a high-profile sport, he would have to make hard choices. Frazier learned that many fans in the stands were cheering for the uniform, not the black skin inside the uniform. While some in the community cheered the football team, others denounced the team’s decision to become political. “It was a good 50-50 split,” he said. But he knows from his experience at Missouri and from participating in sports that sports can be a healing force and a catalyst to spark honest conversation. Frazier’s dilemma is shared by a growing number of professional black athletes participating in the high-profile sports of football and basketball at the collegiate and professional levels. Is an athlete a black man first and athlete second? Are his obligations to family first? The good news is that they understand that there is a battle to be fought against bigotry and intolerance and that sports can be a powerful tool to fight that good fight. In a climate where white supremacists feel emboldened to openly spew hate, Frazier and others must decide which battles to fight, when to fight them and how. And there is the question of identity: Is an athlete a black man in America or a Cleveland Browns rookie free agent trying to make the team? “I’ve got to put athletics before everything right now, just because I’ve never had the opportunity to make this much money,” Frazier said. Kurt Benkart and Marcell Frazier are evidence that, in the face of a rising tide of hatred, the era of athlete activism is expanding, not waning. They will fight battles in their own time, in their own way. Benkart, a white rookie quarterback from Cape Coral, Florida; Frazier, a black rookie linebacker from Portland, Oregon.